The SMCP group (supported by the Lvmh and Arnault groups) signed a contract with TRANSITIC® to equip its new 10,000 m² warehouse in Marly-la-Ville, near Roissy. The group, formed in late 2010, includes the brands Sandro, Maje and Claudie Pierlot. Today, SMCP has a turnover of €297 million euros thanks to its network of stores. After having set many milestones in Europe, the brands of the group are now entering new markets, such as the United States and China. 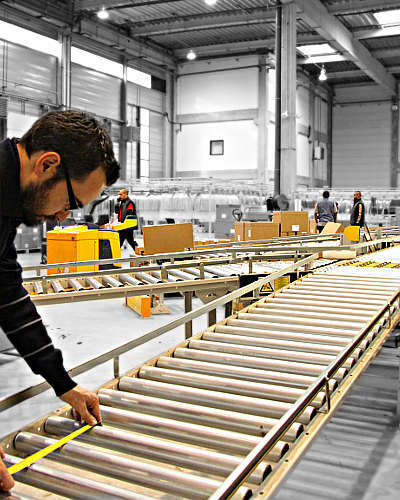 The objective of the SMCP warehouse equipment is to optimise production, increase storage capacity and streamline flows. The building currently consists of a “folded and suspended" storage area as well as a “preparation" area to continuously supply the 540 points of sale and to respond to very short re-stocking flows. This also allowed the group to grow and explore other markets. The TRANSITIC system is installed in synergy with a logistic software package enabling the delivery of collections in three waves of locations dedicated to the different brands of the group. 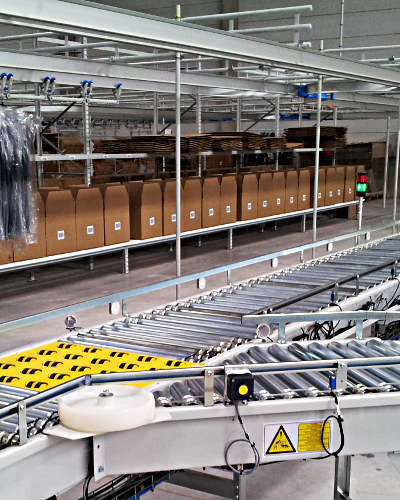 An overhead conveyor allows the transfer of clothes from one point to another, the shipment is managed by a flat conveyor and storage is provided by static shelving. This installation has allowed SMCP to multiply its productivity fourfold; from 500 to 2,000 cartons / day.